Online Taxi services are booming in India. In midst of so many cab services and with raising concerns for Women’s safety, the battle is still on to make the Cab services more and more sophisticated and secure. The recent report by Forbes on how this is opening up an Entrepreneurial Door proves the point this is just a start for the next big thing in transportation services in India. KickStart Cabs gets it right with its unique offering – A cab service with a special provision for disabled and senior citizens. It is a pain for elderly and people with disabilities to commute between places, especially the process of boarding and de-boarding. 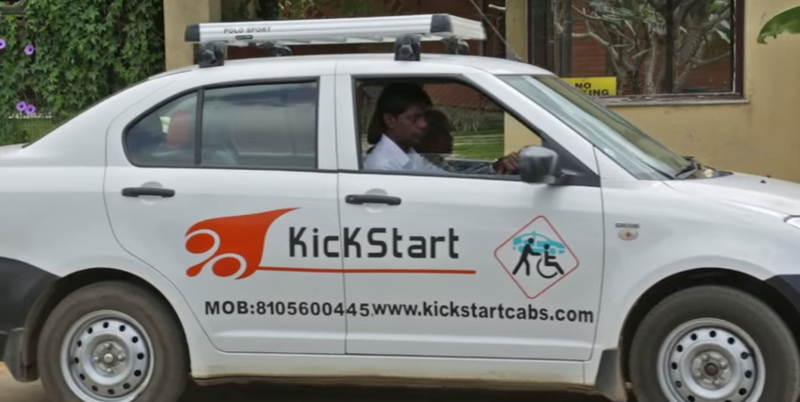 KickStart addresses this need in particular by introducing cabs where it comes with a special type of sliders to make it easy for the commuter to board the cab. The service itself offers an end-to-end package for its customers giving a special attention to old and disabled, right from helping the customer to board the car till the end of destination. Below is the video which demonstrates Kickstart service. Specially Trained Staff who takes care of old and disabled. All Cabs are remodeled to suit the needs of disabled. Accessible website for disabled where one can do cab booking. Kickstart service is currently available in Bangalore , one could visit their website www.kickstartcabs.com to book a cab and avail their services. The service looks promising as the people in the core team in past had worked in the disabilities sector, that could bring more confidence into the service. Point-to-Point, Local Hire and Airport transfer are the services which they offer currently in Bangalore. You can check out more details by visiting their website. Stay connected with GaadiKey for all the Auto news!